The last we heard of David Gedge was when we was the front man with the criminally underrated Cinerama. The keyboard player was then Gedge's girlfriend Sally Murrell. 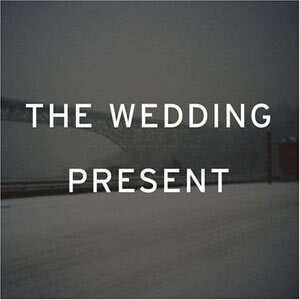 Since they split up, musically and romantically, he's returned to the name that made him an indie icon in the 80s and 90s, namely The Wedding Present. Like Beck's recent "Sea Change" album, "Take Fountain" details the disintegration of a once loving relationship. Recorded last summer in America "Take Fountain" is less frantic than say "Bizarro", but still retains that unmistakable Wedding Present sound that they made their own. "Interstate 5" has a controlled, less angry and forceful vocal than previous. Gedge pours his heart out in a mournful, sorrowful and confessional manner. When Gedge sings "Will you recognize my face this time next year?" you can feel his pain and sense of loss. This is a real progression since "Kennedy" and although Simon Cleave's guitar is suitable raw and immediate, the inclusion of an extended orchestral outro reminiscent of a mexican western is a genuine surprise. "Mars Sparkles" is a slow moving track. It's lyrically painful, but pleasant enough as the gentle strumming of the guitar segues majestically to the string laden soundtrack to traumatic matters of the heart. It's sensitively crafted and would have even the most cynical and hard hearted fan wiping a tear away. Terry De Castro's bass on "It's For You" leaves David Gedge's vocal very low in the mix. It has a live, almost grunge sound, not unlike their work with producer Steve Albini. All this and a brass interlude too. "Perfect Blue" may be well orchestrated, but it's still typical Wedding Present fodder. The female backing vocals are a welcome diversions to David Gedge's outpouring of despair with the guitars gently creeping in. With all the suffering David Gedge has encountered he certainly doesn't sugar coat the truth. This no nonsense approach of a gruff Yorkshire man channelling his turmoil through the craft of song writing must be a cathartic experience. He currently has a new partner, but after the hassle of recovering from the initial break up, I for one am glad that i'm single.